Frank Lloyd Wright (1867-1959) is widely considered to be America’s greatest Architect. 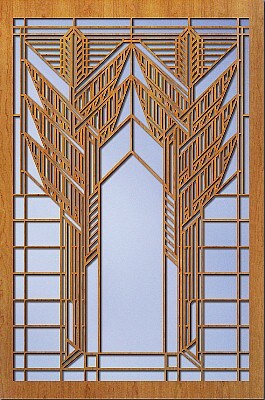 Adapted from Mr. Wright’s original designs, the Frank Lloyd Wright Collection® Art Screens are well-crafted reproductions. These Art Glass Elements are a wonderful home accessory that can dress up any wall or window. The designs are true to Wright's timeless vision and style. All the elements are 1/2" laser cut cherry veneer panels finished both sides. The panel heft of 1/2" eliminates the need for a frame. The edges are a smooth dark brown. There is a single key hole in the back for hanging. Because each Art Screen is made from real wood, color and grain will have an attractive variation piece to piece. Manufactured in California USA, please allow 2 - 3 weeks for delivery. Also due to the size of the screens, they ship 'oversize' requiring an additional shipping charge. NOTE: 5 NEW items are included below!